Fish would have to be more low-maintenance pets around. I mean, you don’t have to take them out for a walk, spend a few hours playing with them, or ensure they get ample exercise. They don’t need grooming and are mostly clean. Fish food is less expensive, too. Despite that, they still manage to give you a sense of calm and companionship. No wonder they’re quite a popular choice for pet owners. Of course, that doesn’t mean fish do not require some expert handling, or at least a little knowledge in the part of the pet owner. If you’re in the market for a pet of the fishy kind, then you ought to start with the essentials. 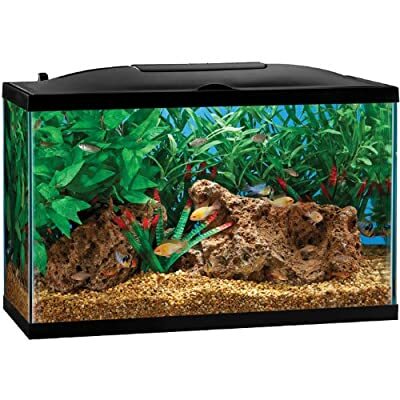 Personally, when I decided to get some fish for pets, I wanted a small set-up. But I have since realized that a fish bowl is no fun for me or my fish. So I went for a bigger, 29 gallon aquarium. What I ended up getting was the Marineland (Aquaria) Biowheel 29 gallon Aquarium Kit with LED Light. Dimension: 36 x 26.2 x 18 inches. Bio-wheel aquarium kit with updated hood and LED lighting. 3 position switches – on, blue, off. Food and water care samples. The Marineland Biowheel 29 gallon aquarium with LED light is cheaper than most brands of the same size. The cheapest I saw online was just around $150. I got mine from Amazon at a little under $230. The description initially turned me off because the dimensions were very confusing. It’s almost like they were for a larger setup. I think that has since been changed, though. Overall, I had minimal issues with this brand. The hood and light can be easily replaced. I’ve heard of some people having issues with its filter but mine works great. I found the hood and filter were too easy to set up. The glass is very thick and well put together. The hinged hood is great for feeding and for maintenance. It is nice to not have to place a dripping hood on a towel when cleaning. The LED lighting is very nice. The LED light fixture is protected by a clear window on the hood, so it won’t get corroded by water splashing up from the filter or evaporation. The white lights are bright and show off the colors of the fish and the decorations. And the blue moon lights are just awesome. Looks beautiful in the living room at night. Now, many aquarium owners complain about lighting systems heating up the entire aquarium. From my experience, though, this one doesn’t heat up the tank at all. The Bio Wheel filter is nice because it provides bio filtration in addition to the carbon. I read Marineland is known for filtration and high capacity designs. Well, I certainly wasn’t disappointed. The pump and filter don’t create too much noise. The tanks give an illusion of the fish swimming freely. They also have heaters intended for tropical fish. Easily replaceable hood and light. Confusing item description in many websites might turn people off from actually buying.